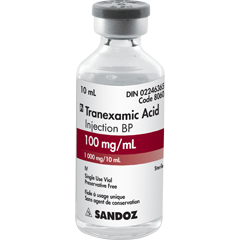 Tranexamic acid is also known as aminocaproic acid. Tranexamic acid is useful in treating patient with hemophilia or any bleeding disorder associated with fibrinolytic therapy or disorder in blood clotting. Tranexamic acid will inhibit fibrinolysis by inhibiting the activation of the plasminogen. The common side effects of tranexamic acid are thrombosis, hypotension and gastrointestinal discomfort.